here are a bunch of new tricks I want to teach my brain this year, and being sick for half of 2008 so far hasn't been helping. But I've been feeling much better in the last few days and have been itching to get back to it. A couple of days ago Borders sent out 40% coupons, so I headed down to one of the bigger Borders around here to see what they have (printing out my current wishlists using this previous trick). 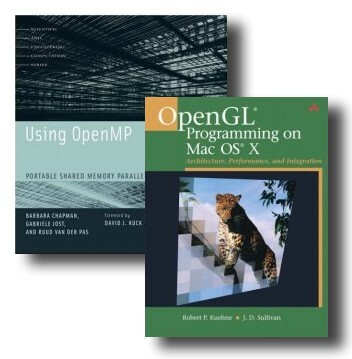 There I found the two books pictured here on OpenMP and OpenGL programming, which look at just the right level and not so long that I take forever to get through them. OpenMP is something I've been meaning to get around to since early in '07, only back then I just had my one-core G4 laptop as my main dev machine. These days I have this 8-core beast below the desk just asking for something interesting to do, and parallel processing is a core competence I want to have going into the future. (I'm actually surprised at how many programmers are completely disinterested in it.) OpenMP dovetails nicely with my drive to get better at scientific computing, especially to spend time doing some of the physics stuff I have wanted to get back into. On the visualization side of life, I've toyed around with OpenGL and made a few applications with it, but I want to amp that up a bit. I don't think it's time to really dive in and get that giant 2-volume set on the subject (no time for that kind of concentration on one topic), and this book on OpenGL development, specifically on the Mac, looks just right. I'm hoping to get some visualization projects kick-started with its help. Anyone else exploring OpenMP or OpenGL this year? Other neat things? Advice?